Laetitia Darche (19, 1.72m, Port Louis) was crowned Miss Mauritius 2010 on September 25 at the Mövenpick Resort and Spa Mauritius in Bel Ombre. She will represent Mauritius in Miss Universe 2011. The first runner-up is Joëlle Marie Justine Nagapen and Gloriana Joseph is the second runner-up. Joëlle Marie Justine Nagapen will represent Mauritius in Miss World 2011. Will China-Norway current diplomatic relations have an effect in Miss World results? 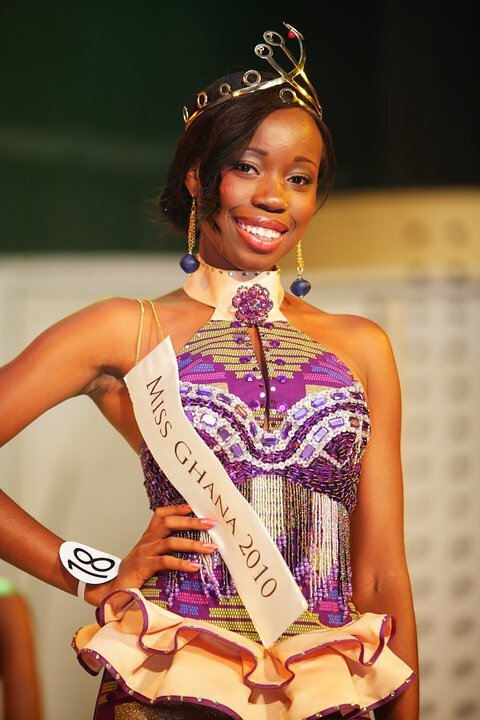 In little over than 5 hours, Miss World 2010 will be crowned. Most of pageant websites, including us, and betting agencies have the contestant from Norway as the absolute favorite for the crown. In early October, the Norwegian Nobel Committee awarded the Nobel Peace Prize to Lui Xiabobo for his long and non-violent struggle for fundamental human rights in China. This sparked a diplomatic crisis between the government of China and Norway. 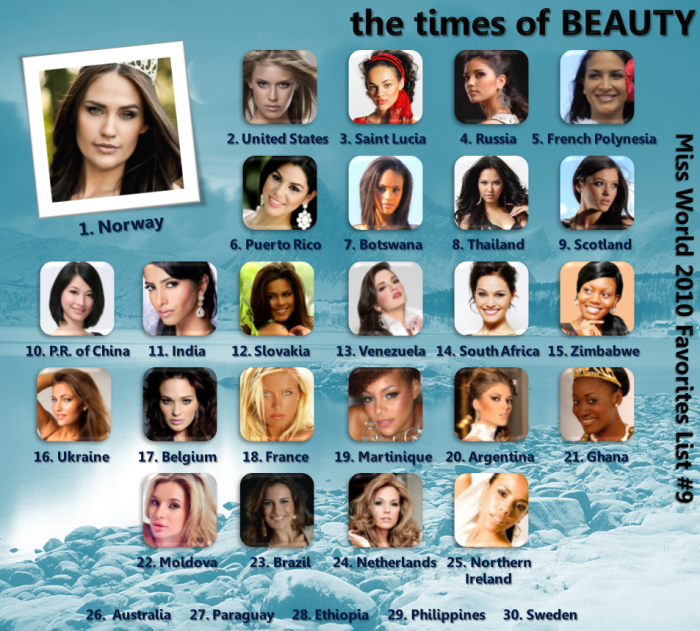 Will this have an effect on Norway's chances of winning Miss World? We hope not and more importantly we hope that the Miss World results are not influenced or biased with international politics. It would be shameful to see the chances of a delegate harmed because of outside pressures and involvements as part of the common censorship methods from the government of the People's Republic of China. If Mariann Birkedal is not crowned, we hope it is because she did not deserve the title rather than because the government of China told you not to do so. Keep the pageant free of politics, MWO! Adjust your time according to the nearest country that applies. Faith Chibale (21, 1.72m) was crowned Miss Malawi 2010 at the Capital Hotel in Lilongwe. 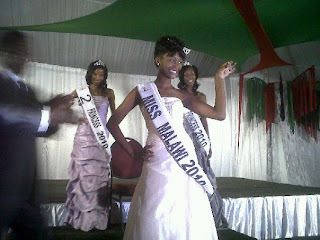 She will represent Malawi in Miss World 2011. The first runner-up is Carolyn Zulu and the second runner-up is Melvis Ngulube. Vanessa Andrea Gonçalves Gómez (25, 1.77m, Baruta) was crowned Miss Venezuela 2010 at the Palacio de Eventos in Maracaibo. She will represent Venezuela in Miss Universe 2011. Ivian Lunasol Sarcos Colmenares (21, 1.79m, Guanare) finished in second place and was crowned Miss Venezuela Mundo 2010 at the same event. She will represent Venezuela in Miss World 2011. For the Miss World 2010 Fast Track Scorecard we assigned 100 points to the winner, 85 points to the 1st runner-up and 75 points to the 2nd runner-up. If there is a Top 5, the contestants that finished in 4th and 5th place received 40 points. Every Top 20 finisher received 30 points and if there was a Top 40 they received 20 points. Norway is the overall leader after winning the Miss World Top Model fast track and finishing as 2nd runner-up in Miss World Beach Beauty and Miss World Sportswoman. She is followed by United States and Ireland. 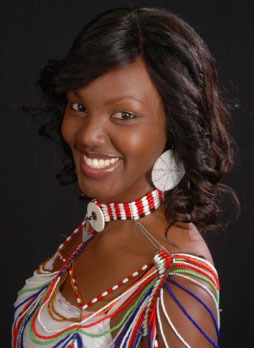 Natasha Metto, from Kenya, won the Beauty with a Purpose 2010 fast track at the Crowne Plaza Sanya Resort. She is now fast tracked to the semifinals of Miss World 2010 becoming the fifth semifinalist of the 60th edition of the pageant. Ghana and El Salvador completed the Top 3. 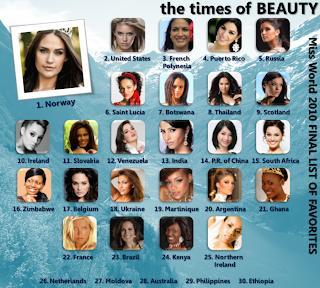 Norway won the Miss World Top Model fast track and now is officially one of the Top 25 semifinalists of Miss World 2010. 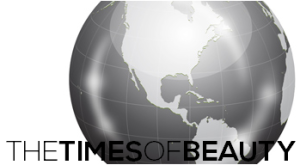 TimesOfBeauty.com is the only website that have consistently placed Norway in our Top 5 since September 5, leading the majority of our lists of favorites. In our 9th list, she continues to lead. United States is in second place, followed by St. Lucia. Russia and French Polynesia complete our current Top 5. 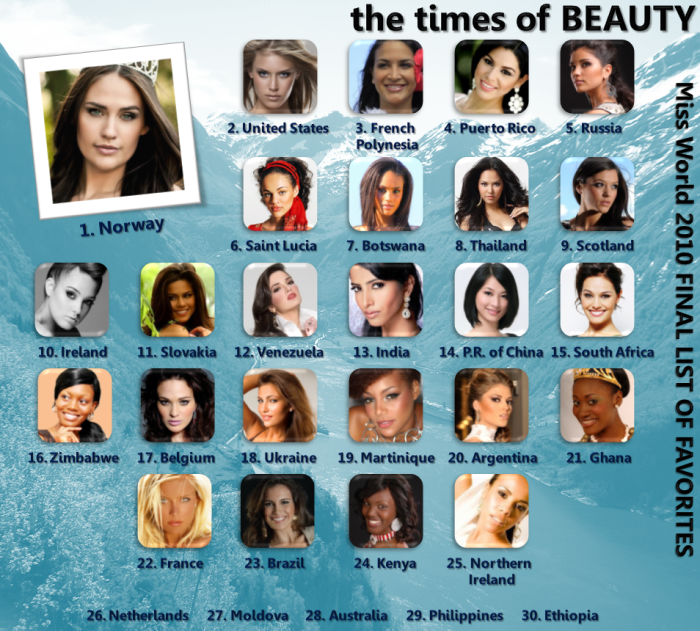 The Miss World Organization confirmed a Top 25, this is the reason why we expanded our list of favorites to 30. 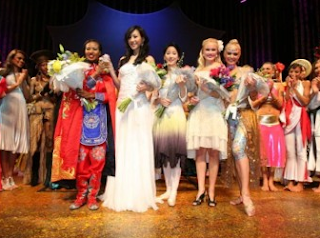 Lori Moore, from Northern Ireland, won the Miss World Sportswoman 2010 fast track at the Sheraton Sanya Resort. She is now fast tracked to the semifinals of Miss World 2010 becoming the second semifinalist of the 60th edition of the pageant. Slovakia and Norway completed the Top 3. 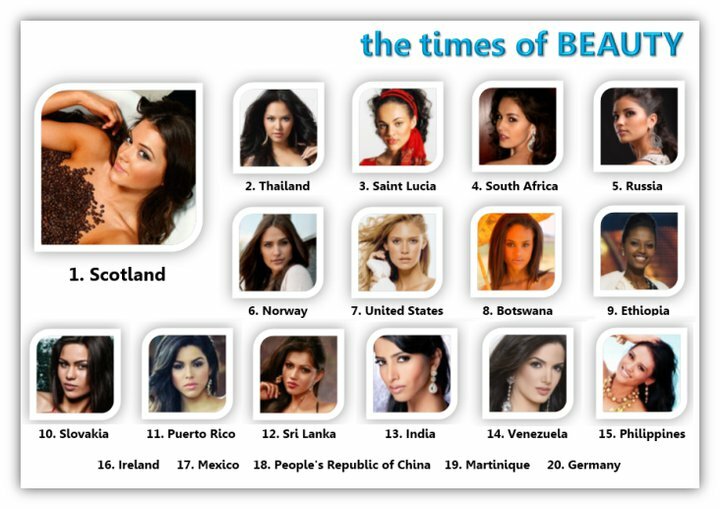 The Top 20 semifinalists for Miss World Sportswoman 2010 were Australia, Cayman Islands, Botswana, Brazil, Canada, Finland, Guyana, Ireland, Hungary, Iceland, Mongolia, Paraguay, Martinique, Northern Ireland, Norway, Slovakia, St. Kitts and Nevis, United States Virgin Islands, Turkey and Wales. The Miss World Beach Beauty 2010 just started at the Mandarin Oriental in Sanya. The winner will be fast tracked to the semifinals of Miss World. We will post here the live announcements from the Miss World Organization. 1:55pm (Sanya Time): The girls are parading in their red swimsuits exclusively designed for the Beach Beauty Final! 2:00pm (Sanya Time): The 7th Miss World Beach Beauty final officially starts! Comment: The first Beach Beauty final was staged in Sanya back in 2003. It was an innovation from the Miss World Organization that proved to be very popular. The winner of the first edition was Rosanna Davison from Ireland who later won the Miss World 2003 crown. 2:01pm (Sanya Time): The contestants are presented one by one in front of the panel of judges. Comment: The only Miss World titleholder that did not qualify to the Beach Beauty finals was María Julia Mantilla García in 2004. 2:06pm (Sanya Time): All the contestants were presented to the panel of judges at the Mandarin Oriental. Comment: Four of the forty contestants are from the Americas, eight from the Caribbean, ten from Asia and Oceania, and fourteen are from Europe. 2:27pm (Sanya Time): The Top 20 are... Australia, Bosnia and Herzegovina, Czech Republic, Botswana, People's Republic of China, French Polynesia, France, India, Ghana, Israel, Hungary, Netherlands, Puerto Rico, Paraguay, Martinique, Norway, Scotland, Thailand, Zimbabwe, United States. Comment: Shocking eliminations of Russia, St. Lucia and Ukraine! 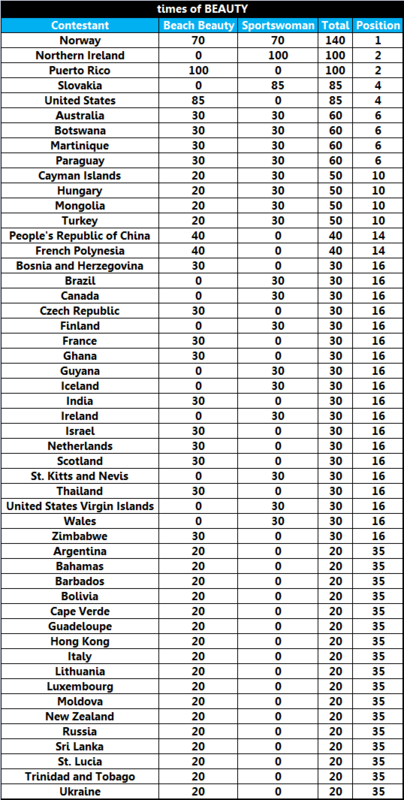 Argentina, Bahamas, Barbados, Bolivia, Cape Verde, Cayman Islands, Guadeloupe, Hong Kong, Italy, Lithuania, Luxembourg, Moldova, Mongolia, New Zealand, Sri Lanka, Trinidad and Tobago, and Turkey were also eliminated. St. Lucia continues to lead our list of favorites for Miss World 2010. She continues to amaze everyone with her beauty and personality. Botswana is in 2nd place followed by Thailand in 3rd. 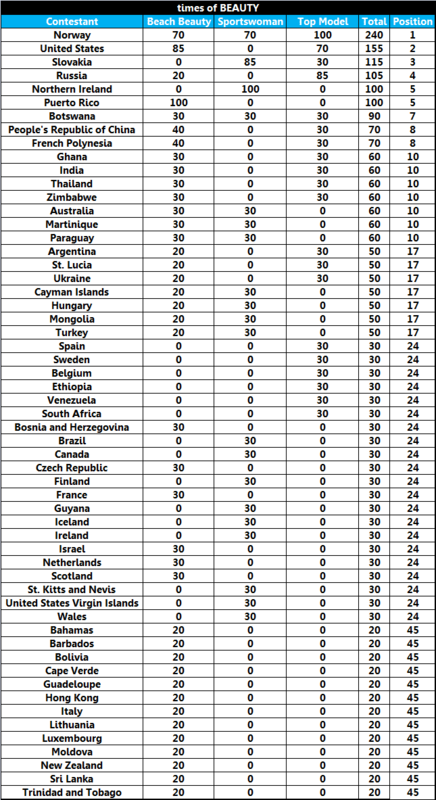 The contestants from Russia, Norway, United States, Scotland, South Africa, Puerto Rico and Venezuela complete the Top 10. France and Bahamas are new in our list after a good performance in the past days. 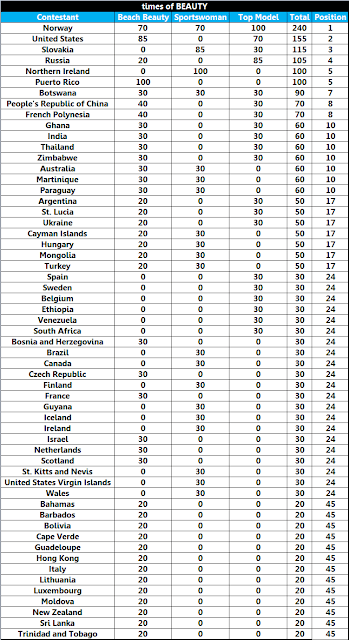 They are joined by India, Slovakia and Moldova to complete our Top 15. The People's Republic of China, Netherlands and Zimbabwe are slowly gaining ground.